Dropping screws on the job can kill your productivity. 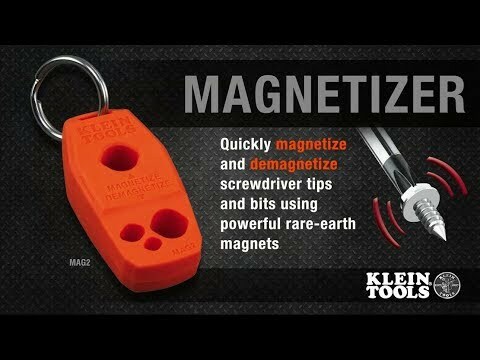 Always have a magnetic screwdriver handy with Klein Tools' Mag2 Magnetizer/Demagnetizer.Quickly and easily magnetizes your screwdrivers and bits to hold your fasteners on the tip of your screwdriver and get the job done fast. This compact tool is great to have on hand when you need a magnetized screwdriver or bit. Powerful rare-earth magnets provide a fast, strong, long lasting charge. Easily attach it to your tool bag with the included stainless steel key ring. Once you have one, you'll wonder what you ever did without it.